President Trump had been busy drafting executive orders and showing the signed copies for the camera. But little did he know that creative people on the internet are going to take it to another level. 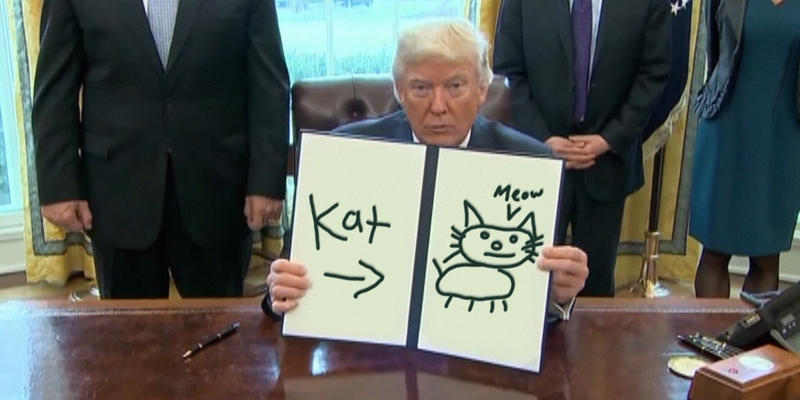 As soon Trump’s video showing orders went viral, various memes started surfacing, making fun of the signed order by replacing it with a funny drawing and caption. Now, someone took these memes to a whole new level by launching a dedicated app that allows everyone to show their funny side with Trump’s executive order. The app is called “Donald Draws: Executive Doodle.” and it is up for download on Google Play. You can upload your choice of photo to replace the order or even draw something in-app and add a funny caption to it. After your masterwork is ready, you can share it on Facebook and Twitter. You don’t have this app? Sad. You don’t need this app? Wrong. You’re wrong. This app is gonna be uge. It’s gonna be big. It’ll be the biggest app. It’ll be the best app. It is the best app. This app is gonna make the United States of America great again. It’s gonna be everything. We wonder if Trump is going to sit quietly after knowing about this app. Maybe, he can ban this app from entering the US too. In case you are feeling creative and want to flex your funny side then you can install this app and share your version of executive orders on social media. The app is currently available on Android only, but if it turns out to be a “Uge” success, then we might see it debuting on App Store too. Are you going to try out “Donald Draws: Executive Doodle” app? If yes, then we would love to see your version of Trump’s executive order in the comment section below.